Nobel Laureate Joseph Stiglitz on "People, Power and Profits: Progressive Capitalism for an Age of Discontent"
In his new book, People, Power and Profits: Progressive Capitalism for an Age of Discontent, Nobel Laureate Joseph Stiglitz lays out a 21st century Social Contract to rebuild the American middle class and reinvigorate the American economy. 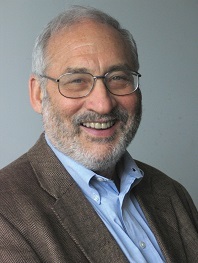 Join us for an evening with Prof. Stiglitz, in a conversation with Columbia Business School Professor and value investing guru Bruce Greenwald. Join us for a 90-minute walking tour of the Financial District focusing on the history of financial panics and crashes. Richard Naclerio on "The Federal Reserve and Its Founders"
Join us for a lunchtime event with author Richard Naclerio as he reveals the highly secretive events that surrounded the Fed's creation and the bankers, financiers and economists that played a fundamental part in shaping both its organization and the role it would play over the next century. Andrew Browning on "The Panic of 1819: The First Great Depression"
Author Andrew Browning will speak on his new book on the first nationwide financial crash, which ushered in the first Great Depression and introduced the world to the business cycle – the pattern of booms and busts that we have come to know so well. Brent Goldfarb and David Kirsch on "Bubbles and Crashes: The Boom and Bust of Technological Innovation"
Join the Museum and the NY Public Library at its 34th Street location for this lunchtime talk and book signing with authors Brent Goldfarb and David Kirsch on Bubbles and Crashes. Join us for a 90-minute walking tour of the Financial District, with an emphasis on George Washington, Alexander Hamilton and 18th century financial history. Join us for a 90-minute historical walking tour of the Financial District. Kim Phillips-Fein on "Fear City: New York's Fiscal Crisis and the Rise of Austerity Politics"